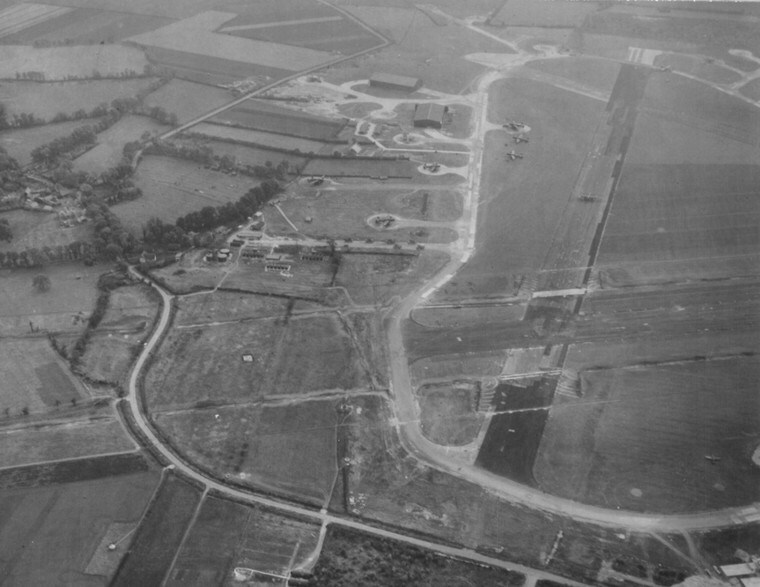 This was a Class A airfield constructed 1941-42 to the west of Graveley village which itself lies 4.5 miles south of Huntingdon. Most of the land used was that of Cotton Farm and the construction also involved the closure of the ancient Roman Way road. The main contractor was Messrs W & C French, the three runways being 09-27 at 1,600 yards, 15-33 at 1,320 yards and 03-21 at 1,307 yards. The usual total of 36 pan-type hardstandings were distributed round the perimeter track. There were two T2 hangars on the technical site between runway heads 15 and 21 and a Bl and T2 in the south-east corner of the airfield between runway heads 27 and 33. The bomb store was located in open country to the south-west. 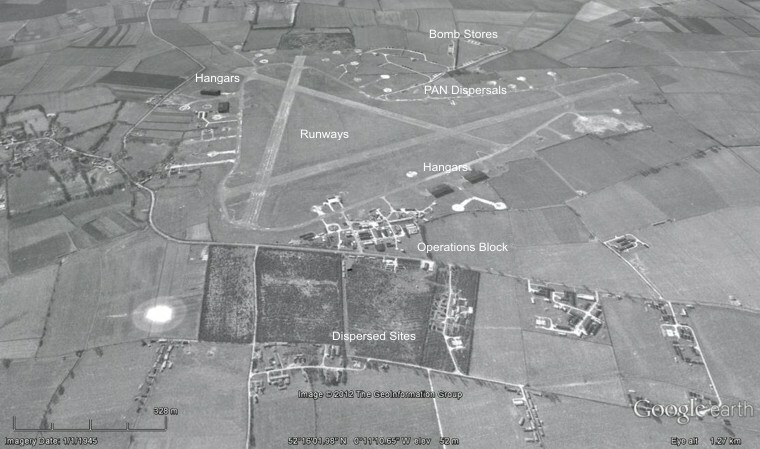 Dispersed camp sites lay to the north of the airfield, consisting of nine domestic, one communal and sick quarters with maximum accommodation for 2,300 males and 299 females. The station came into use in the spring of 1942 as part of the Tempsford clutch of airfields where `special duties’ units were concentrated in No. 3 Group. No. 161 Squadron with Lysanders and Wellingtons arrived from Newmarket in March and was moved on to Tempsford the following month. Little activity occurred at the station during the next three months apart from runway lengthening, the main 09-27 being extended at the 09 end to 2,000 yards; 15-33 on the 33 end to 1,420 yards; and 03-21 at the 03 end to 1,407 yards. This improvement and associated works affected three pans, three loop standings being furnished to make up their loss. During the course of this work, extensions of taxiways to the ends of the extended runways caused the destruction of three pan hardstandings. At the beginning of August, Graveley was re-allocated to the Pathfinder Force which brought in No. 35 Squadron and its Halifaxes from No. 4 Group at Linton-on-Ouse. Their first operation from Graveley took place the night of August 18/19, 1942. On New Year’s Day 1944, No. 692 Squadron formed at Graveley to fly Mosquitos for No. 8 Group, undertaking its first sorties exactly a month later, the squadron becoming part of what was known as the Light Night Striking Force. In March, No. 35 Squadron exchanged its Halifaxes for Lancasters, which it operated until its final sorties on April 25, 1945. No. 692 Squadron Mosquitos carried out their last raid on May 2/3, 1945 with an attack on Kiel. In 310 operations from Graveley the squadron lost 17 Mosquitos and a total of 150 Bomber Command aircraft were missing or crashed in the UK in operations flown from this station: 83 Halifaxes, 32 Lancasters and 35 Mosquitos. In June 1945, No. 692 Squadron was moved to Gransden Lodge and No. 227 Squadron with Lancasters joined No. 35 at Graveley to prepare for movement to the Far East as part of Tiger Force. Cancellation of this venture brought disbandment of No. 227 Squadron in September with No. 115 Squadron being moved in from Witchford to replace it. The Lancasters of Nos. 35 and 115 remained at Graveley for a year before being transferred to Stradishall with its permanent camp. During this time, No. 35 Squadron took its Lancasters on a goodwill tour to the USA. Although Graveley was put on care and maintenance in September 1945, and no more RAF units were based there, this wartime airfield was kept as a reserve for the next 12 years. During this time the main runway was maintained in good condition and regularly used by training aircraft for `circuits and bumps’. Graveley was closed at the end of 1968 and was eventually reclaimed by Cotton Farm. The eastern end of the main runway still survived in the late `nineties and a reduced perimeter track is used as a farm road. photo part of airfield looking south.